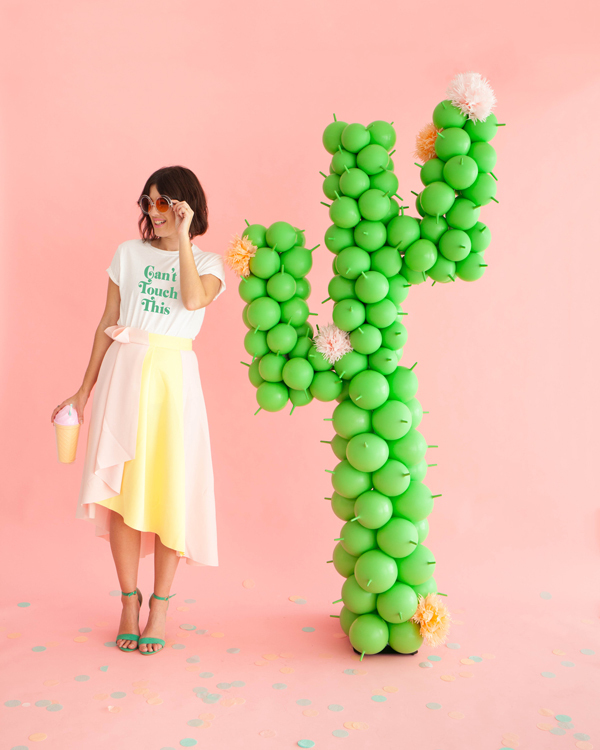 In case you haven’t noticed, cacti are definitely having a moment right now. They’re just so cute and iconic! 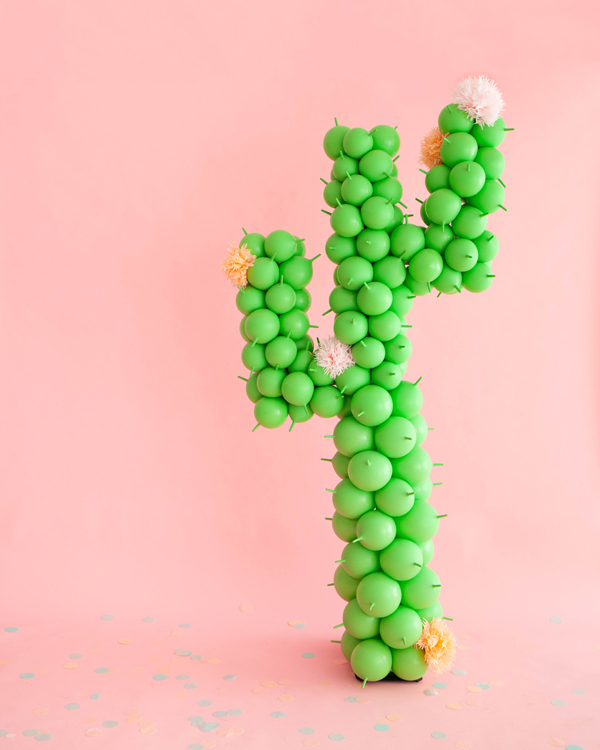 We decided to create our own giant cactus out of balloons, complete with flowers and prickly spikes (thanks to these linkable balloons!) 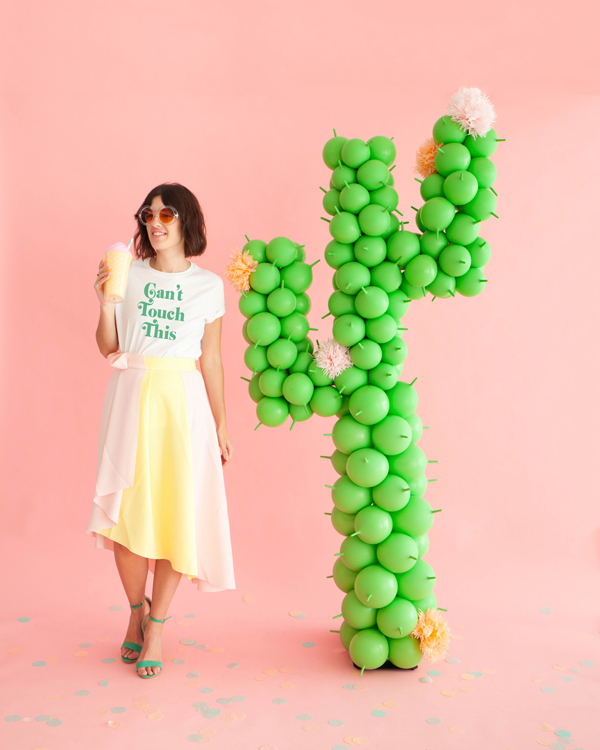 This project is perfect for your next party, and would be darling with our llama pinata! Read on to see how to make it! Step 1: Use a saw to cut the pipe into 7 pieces: one 11”, one 16”, one 40” and three pieces of 12”. Put the pieces together as the picture shows (the shape of a coat hanger) and then stick the whole base of pipes on to the lamp stand, so the lamp stand is inside the pipe. Step 2: Fill the balloons with air to approximately 6” in diameter and tie two balloons together. 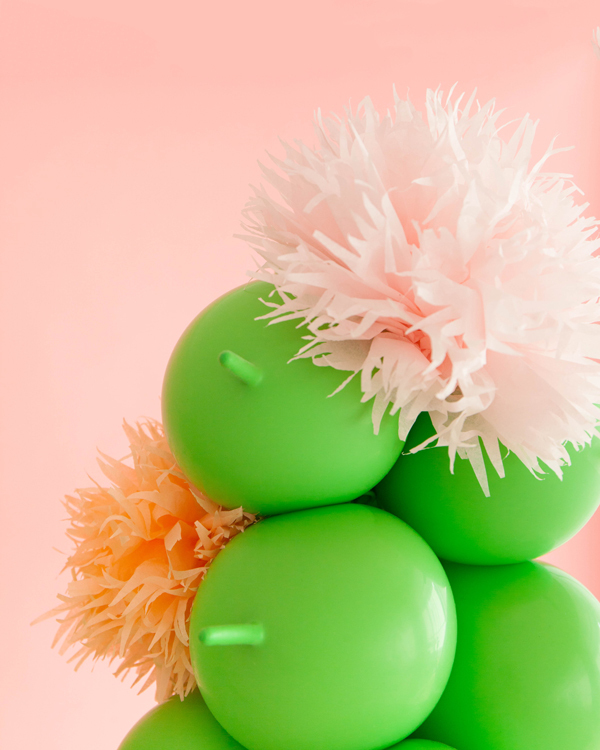 After that, twist two pairs together so it becomes a cluster with 4 balloons. Take one cluster (4 balloons) and do a figure-8 with the twine in the middle of the balloon cluster, two times. 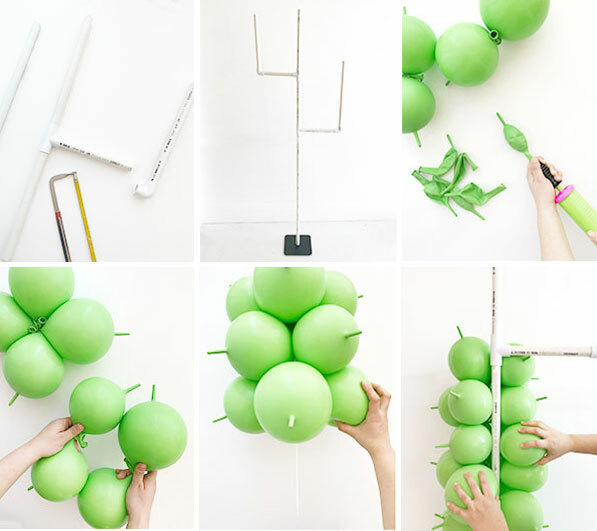 Then add another cluster of balloons, press down in the middle of the cluster, then make a figure of 8 with the twine and continue to add cluster’s of balloons so it becomes a mini balloon column. 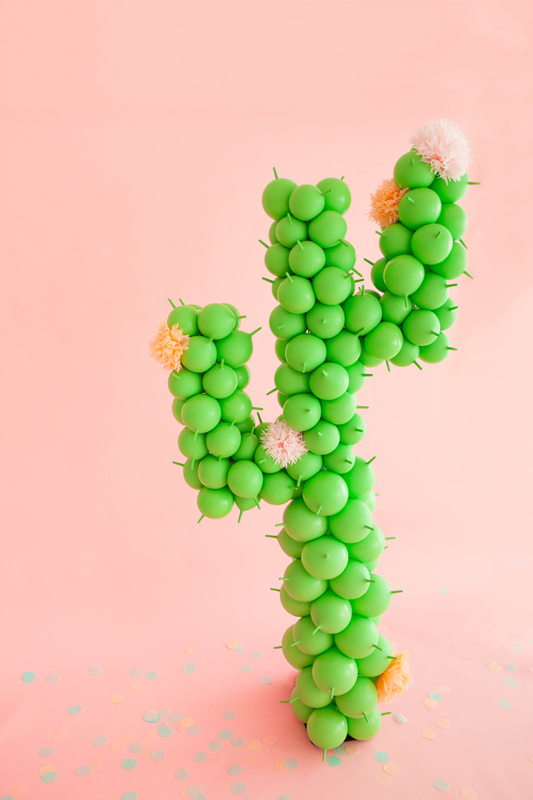 Step 3: When you have a mini balloon column the height of one piece in the cactus base, cut the twine and press the mini column in to the base so the pipe ends up in the middle of the balloon column. Then continue to fill the base with balloons until you are completely covering the pipe. You’re good to go! Step 1: Take three pieces of tissue papers and stack them on top of each other. Then, cut out a rectangle in the size of 7” x 14” for the small flower and 9” x 18” for the big flower. For this cactus we made 3 small flowers and 2 big ones. Step 2: Start folding the paper from the smallest side of the rectangle and then continue folding the whole piece so when you unfold it, it has the shape of a fan. Step 3: Tie a knot in the middle of the folded paper with the twine. Cut the sides of the paper so it has the shape of spikes and then start to fold out each tissue paper. You have a flower! 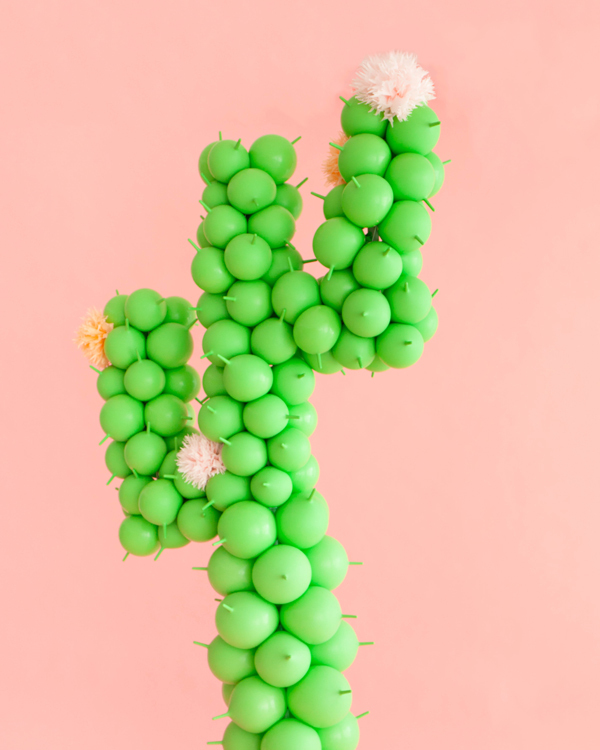 Step 4: Attach it to the cactus by doing a figure-8 with the twine around the balloons. Nice tee shirt ! Where is it from please ? This is awesome and SO CREATIVE! You guys are like party MacGyvers! The ‘can’t touch this’ tee is gold! wow! it took me a while to understand they are actually made by baloons!